Transparentsea Last Message from Billabong on Vimeo. 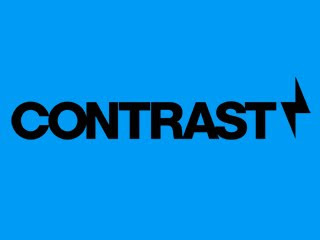 I'm really proud to post this blog on behalf of my braddahz from Japan Keisuke Imada and Hisamitsu "Broken" Iijima! Keiske and Broken are the dynamic duo that is Budiasa! Clips is Budiasa's newest project and by the looks of the cover shuvits really grab my attention. Welcome to everyone of all ages to come down to Velzyland Park by 8:00 am to participate in the North Shore Beach Clean Up. This is a great way to rub shoulders with the top pros and legends of surfing and the Triple Crown. Always wanted to do your part to keep the community that your surf in clean, here you go and it doesn't matter where you live or are from. After the Beach Clean up I heard the top Pros are going to be doing a free autograph signing for the keiki! 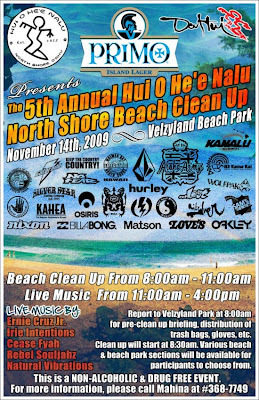 Guys like Bruce and Andy Irons, Reef McIntosh, Makuakai Rothman, Freddy P, Sunny Garcia and many more will be lending their hands in cleaning the North Shore and signing posters for the kids! Today I went up to Sunset Beach to meet up with my two grom team riders for Ronin Eyewear. Takumi Yasui from Kamogawa, Japan is here surfing and training for the winter season. 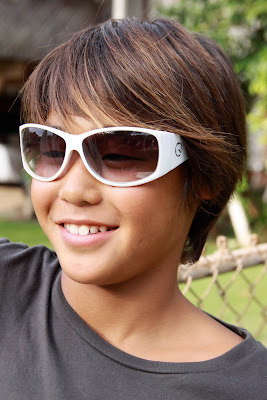 Takumi is staying with Mahina Maeda's house, the perfect spot for an up and coming Japanese grommet! Takumi and Mahina have such big futures ahead of them and I'm stoked to be apart of it! I remember what it was like being a surf stoked grom, all I wanted to do is surf and that's just how these two are. It's so awesome. 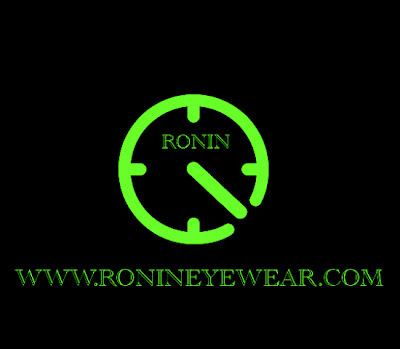 So today I went over and shot them for the Ronin Eyewear Japan Blog and for our upcoming Ads and catalogues for 2010 in Japan! Right after we were done shooting, the kids were out the door to go surf Freddyland. Classic!